Over the past seven-plus years, there’s been a resurgence in the housing market. 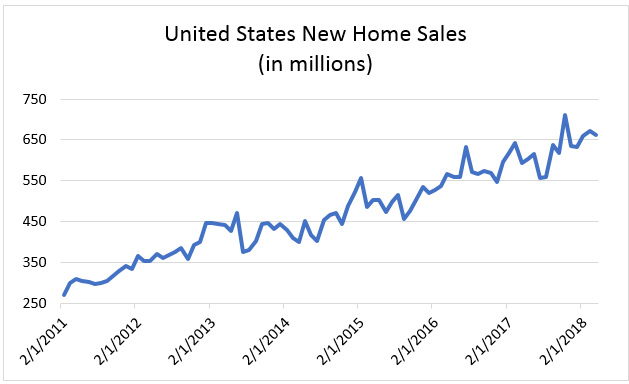 The number of new homes sold per month has gone up by over 140% since February of 2011. For about a year now, there’s even been fear over a shortage of supply. In fact, February saw a 3.4-month supply of existing houses, which is extremely low. Despite all of these sales, the overall monthly supply, which includes both existing and new homes, has continued to stay between five and six months’ worth since July 2013. That’s despite building permits more than doubling over the past eight years. With extremely low unemployment and low interest rates, homes are in such high demand that more and more have to be built. And new demand from millennials is making the shortage even worse. After years of struggling to find jobs and pay off student loans, millennials are starting to make more money: Household income for the generation has gone from $82,000 to $88,200 over the past year. As a result, millennials are moving out, and they prefer to buy homes rather than rent. In fact, over a third of all home purchases in 2017 were done by millennials. There’s just one problem: not enough sellers. That’s because people who bought houses years ago don’t want to move, for a good reason. They refinanced while interest rates were dropping after the financial crisis, and now they’re locked in at a mortgage with an extremely low interest rate. And now that rates are starting to go up again, they’re less likely to move out because they’d have to pay a higher rate with a new mortgage. There are a couple homebuilding exchange-traded funds (ETFs) that make investing in this growth easy. The first is the iShares Dow Jones U.S. Home Construction ETF (ITB). Next is the SPDR S&P Homebuilders ETF (NYSE: XHB). XHB has more focus on higher-growing companies, while ITB is more balanced across a larger number of stocks. But both are down over 10% from their highs in January, and with demand still outpacing supply for new homes, they’re a good investment.